First American CREDCO introduces EXPRESS PCR™ - the fast, dependable solution when you can’t wait weeks for portfolio batch credit scoring. EXPRESS PCR makes it simple to quickly evaluate a portfolio in terms of credit scores. Loan portfolio managers, underwriters and senior managers will appreciate how EXPRESS PCR helps meet corporate growth and return goals, manage portfolio delinquency, and forecast portfolio profitability. Also, before you sell a loan portfolio EXPRESS PCR can help you to determine a favorable price, or to meet a specific buyer's criteria. With EXPRESS PCR, First American customers get fast batch scoring for any size loan portfolio. Your file will be processed and have scores appended in days instead of the weeks you usually have to wait with a credit repository. Smaller portfolios can get the same attention as high-volume users. Internally, EXPRESS PCR will provide a portfolio review tool to facilitate assessing risk-based lending programs, adjust underwriting or servicing criteria or analyze changes in scoring model performance. A summary of the overall results provides an immediate overview for management. You choose either FICO or bankruptcy scores. First American CREDCO chooses the best bureau that can provide the fastest turnaround time. Scores will be appended to your file and returned with an overall summary of the portfolio scoring results, so that you can quickly evaluate the portfolio as a whole. When you use EXPRESS PCR for portfolios of less than 10,000 records, you'll have the information you need within 48 hours. Larger portfolios will be returned within 72 hours. It's easy to order an EXPRESS PCR Portfolio Credit Review. Simply send us the name, address, and Social Security Number for each borrower in your portfolio Contact your First American sales associate for the technical file layout specifications. For an additional fee, we can also convert your file into our standard format. 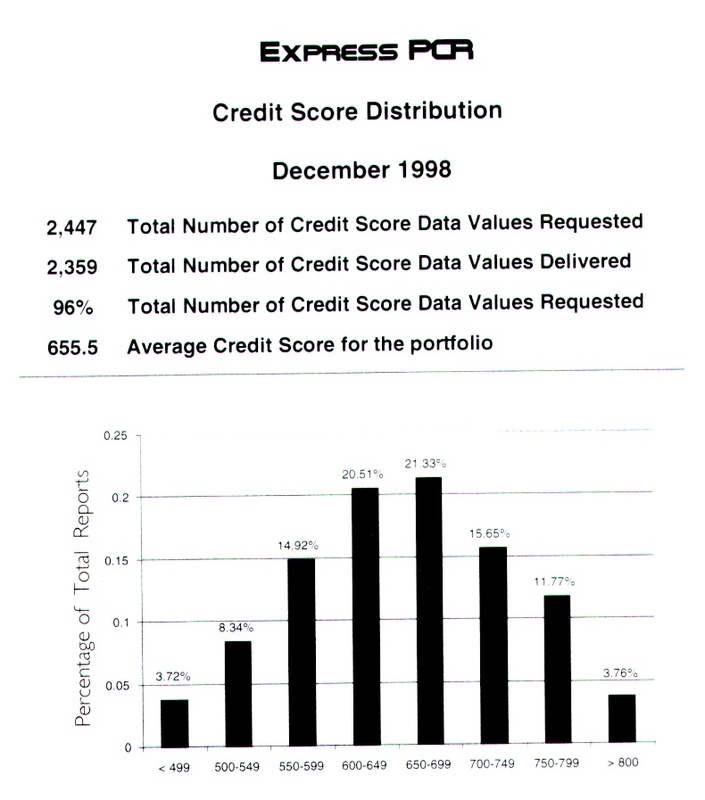 EXPRESS PCR Portfolio Credit Review comes with a Score Distribution Report for FICO or Bankruptcy scores. Use the Score Distribution Report to get an overview of the relative risk and value of the portfolio. The report provides a visual representation of the distribution of scores, as well as statistics on the total scores delivered, and the average score of the portfolio. The Score Distribution Report can also give you insight into the direction to take for more in-depth analysis of the EXPRESS PCR output file. Put EXPRESS PCR to work the next time you need a quick, accurate risk assessment.